Pamela Morgan (1957- ) and Noel Dinn (1948-1993) were founding members of the seminal Newfoundland band Figgy Duff. The group came together in 1975 when Dinn, a veteran of the St. John's rock scene, assembled a band to combine traditional music with rock and roll. Morgan, a singer born and raised in Grand Falls, soon joined on and for the next two decades the group toured the island, honing a distinctive blend of traditional and contemporary music. They collected old songs and tunes along the way, performing them in new musical settings that included drums, amplifiers and electric guitars. 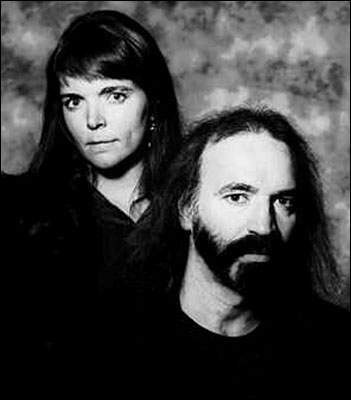 Pamela Morgan and Noel Dinn, n.d.
Morgan and Dinn were the founding members of the band Figgy Duff. Photo by Denise Grant. Courtesy of Amber Music. Morgan and Dinn also emerged as songwriters. The group's last two albums consist primarily of original material and songs like Dinn's Freedom and Morgan's Snowy Night are now among the most popular Figgy Duff songs. They combined to write another of the group's signature tunes, Weather Out The Storm. Figgy Duff was dissolved after Noel Dinn's death in 1993. Pamela Morgan has since embarked on a solo career, which saw the release of another original collection, On A Wing And A Prayer, in 1996. She also continues to pursue traditional music as a solo performer and in partnership with Anita Best. The duo released an acclaimed collection of traditional songs, The Colour Of Amber, in 1993.